Daniel Talmor, M.D., M.P.H., is chair of the Department of Anesthesia, Critical Care, and Pain Medicine at Beth Israel Deaconess Medical Center (BIDMC) and the Edward Lowenstein Professor of Anaesthesia at Harvard Medical School. 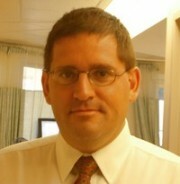 Prior to becoming chair, Dr. Talmor was the Vice Chair for Critical Care Medicine at BIDMC. Dr Talmor’s clinical interests focus on the prevention and treatment of ARDS as well as mechanical ventilation in the ICU.